Conservation and Conspiracies. By Trevor Oertel. Don Pinnock has got his piss in a froth, again. This time it’s with South Africa’s Department of Environmental Affairs. One can only imagine the shrill pitch of his next article! Don is a lucky chap. Through his buddy-buddy connections he has the ear of online publications such as the Daily Maverick and his animal-rights centered articles are featured regularly. Over the years we have sent rebuttals to his articles (written by genuine conservationists) to the paper but none have ever been published. Oh well that’s how it goes I suppose, it’s not what you know it’s who you know. What follows below is a rebuttal to Don’s latest tirade written by Trevor Oertel. You won’t find it on the Daily Maverick webpage, but It really is worth reading. What a misleading one sided narrowminded article that does nothing for the plight of rhinos or conservation but once again feeds the current animal rights anti sustainable use narrative. Your article starts with a summation highlighting three points. Firstly, some or other conspiracy or betrayal stretching across two continents. Secondly mysterious “conservationists” who “are appalled”. And thirdly, the meat of your article, the opinion of an unqualified layman whose credentials on wildlife and wildlife management seems to hinge on the fact that he rubs shoulders with a host of animal rights activists, is a wildlife photographer and an investigator. As a criminologist Pinnock might be more qualified than most to pontificate on conspiracy theories and the underworld but this does not qualify him in wildlife management. The irony is, at least the professional qualifications of the very people being attacked is acknowledged. Though this is quickly trashed by implying or assuming that these trained qualified wildlife professionals either don’t know how to do their job or possibly worse, aren’t doing their job of protecting “endangered” animals. You seem prepared to gamble Africa’s wildlife and an iconic species such as the Rhino on the emotive naïve views of conspiracy theorists. Maybe we shouldn’t be so quick to question China’s decision and rather applaud them for realising that after a quarter of a century of bans we have not stopped the trade in rhino horn or tiger bone. All we have achieved is forced it underground into the murky world of illegal unregulated no holds barred unsustainable trade. There is a trade and a demand already, no one need create it. In fact, the demand is costing South Africa over a thousand rhino lives each year. Why don’t we try trade again? last time round it was quite successful with the then critically endangered White Rhino numbers increasing from less than 500 Rhino to “Near Threatened – Population Increasing” over 20 000 White Rhino today. This successful trade was started in the late 1950s when the late Dr. Ian Player and the then Natal Parks Board decided to break away from a failing preservationist doctrine to that of sustainable use. At the time Player and Natal Parks Board were swimming upstream yet in later years they were lauded with having saved the White Rhino from the brink of extinction. Why aren’t we “risking sourcing moving beyond” illegally unsustainable poaching to sustainable farmed animals, that if standard economics of farming and supply and demand apply will be an expanding population? For one, many an animal rights organisation will loss a cash cow worth millions of dollars. I’m assuming your appalled “conservationists” are a rabid animal rightist from the International Humane Society. There is nothing humane or conservation orientated about the International or any other Humane Society but a very successful, in money terms, animal rights organisation that has very successful been exploiting the public, the rhino and other charismatic megafauna for years. These animals are literally blank cheques as they are used to rack in 100s of millions of dollars each year to save “endangered” wildlife. Sadly, in most cases, a very small percentage if anything at all gets to where the money is needed with the bulk being used for “administration” expenses. But they NPO I hear many cry. Yes, most are, but what does it mean? In the simplest terms it means, unlike public or private limited companies, non-profit companies may not issue owners/directors/shareholders a dividend but there is no limitation on how they spend donor’s money. For the gentleman from the IHS to accuse the Chinese government of having “signed a death warrant” for imperiled rhino and tigers” defies all logic. For the past few years South Africa and other parts of Africa have been hemorrhaging over a thousand Rhino murdered per year. Who signed that death warrant if not a failed ban on trade. I take it the other appalled “conservationist” is the lady from WWF who also seems to think she has made great strides in protecting the over 1000 Rhino which are paying the price of a failed ban each year. Maybe if she reassesses, supported and implemented the WWF’s stated policy of sustainable utilisation and not the current passive role of swimming downstream their efforts to protect tigers and rhinos in the wild might actually bear fruit. But then swimming upstream currently isn’t the popular choice. As pointed out previously, the hero of your article for no other reason than for taking on both the South African and Chinese wildlife authorities in his opinion piece is a man who is so underqualified to air his views on wildlife management one can only assume it was his entertain writing style that impressed you. His argument on selling legal horn, depleted stocks and a system becoming overwhelmed is a clear indication that he has not grasped the fundamentals of legal trade, has about as much understanding of sustainable utilisation, the international blue print on conservation, as the average person has on neurosurgery. And yet he is given an audience and allowed to speak as an authority on rhino and wildlife management. Like a true colonial of a bygone era he has a total disregard for other people culture and values as he sweeps thousands of years of beliefs under the carpet by offering great words of wisdom “the only sensible approach to this problem is to reduce demand in every way possible.” Thank you oh great Yoda, may the Force be with you. After dishing out these great words of wisdom maybe Mr. Pinnock should ask himself if maybe far greater minds, if nothing else, far more qualified on wildlife management than a wildlife photographer haven’t wrestled with these very same questions of how to stop the uncontrolled poaching of rhino and how to ensure that rhino survive into the future might have just come up with the very solutions he is so quick to dismiss and mock. The consumer does not need manipulation, the very nature of man will choose legal horn over poached illegal horn. Or am I to assume Pinnock would rather runs the gauntlet of buying his favourite drink from his local shebeen than the local bottle store. My friends and I haven’t been near a shebeen since we turned 18 and could legal walk into any bar or liquor store of our choice. If the Department of Environmental Affairs with their hundreds of trained and qualified wildlife managers, conservationists, biologists, ecologists and other scientists did not look at eliminating the illegal trade and replace it with a legal sustainable trade I would say it was a dereliction of their duty. After you exposed your readers to three appalled “conservationists” unqualified opinions you fail to give a balanced view by presenting the view of qualified trained conservationists such as Dr. Chris Brown, the CEO of the Namibian Chamber of Environment and former Head of the Namibia Directorate of Environmental Affairs in the Ministry of Environment and Tourism, who addressed the very subject at the time of the Chinese announcement. Besides Dr. Brown we are very fortunate that we have some of the greatest conservation minds ensuring the future survival of our precious wildlife, people like Dr. George Hughes, Professor Brian Child, Ron Thomson, Dr. Rowan Martin, David Cook and many other trained qualified experts in the field. Even the late Dr. Ian Player and Dr. Graham Child still influence how many of us see and implement conservation. Hopefully future generations of conservationists will also learn from their wisdom. An argument that is often put forward is that we don’t know the impacts of legalising trade and it may have a negative impact on rhino conservation. As previously mentioned, legal trade is NOT a new concept. The impact of legalised trade is well known and I think I can be so bold to say is the only reason rhino are not extinct today. We have been so caught up in the animal rights rhetoric that most people have lost sight of the fact that legal trade introduced by Dr. Player and the then Natal Parks Board put a value to Rhino and was very successful with the White Rhino clawing its way from certain extinction to over 20 000 animals today. The price of Rhino within ten years went from R200.00 to R250 000.00 per animal. The animal rights organisations or “animal conservation organisations”, as some like to call themselves these days, promoted ban on the legal trade has resulted in rhino being more valuable dead than alive. These “animal conservation organisations” are not run or managed by trained conservationists, biologists or ecologists nor do they know or understand the first principle of wildlife conservation, yet they are very quick to educate the public on how we should be conserving Africa’s wildlife. They corrode away at the very fabric of Africa’s wildlife legacy as they rally the support of good, honest, caring people to spread their animal rightist naïve preservation doctrine. Anyone that should speak out against this doctrine is labelled an animal hater, carcass fondler and a few other choice unsavoury terms. There is no profession in the world that has as many experts as the conservation game where everyone not only has an opinion but also believes they have a right to dictate to trained scientists how to manage the worlds wildlife. Yet when it comes to some of the most precious earthlings in who’s hands do we leave their fate? We don’t empower trained qualified wildlife management experts to get on with the task at hand and trust their judgement and professionalism. Instead we question their motives if it’s in conflict with what we have been taught by our very active social media animal conservation organisations. We not only allow our new wildlife masters to threaten our sovereign State with trade and tourism boycotts if sound scientific based management policies are not to their liking, we join in, as we flaunt our “animal lover status” to family and friends. It fascinates me how uneducated people in wildlife management believe that a rabid unqualified animal rights activist is better qualified to entrust the future of our precious wildlife than professional trained wildlife managers, conservationists, biologists or ecologists. As with your article it’s not only social media which is to blame. If one looks at the one-sided animal rights narrative the media love to report on without exercising your journalistic duty of reporting both sides of the argument it’s no wonder the public is so misinformed. Maybe if the media started to swim upstream and changed the narrative and showed the public a balanced view, in time, we could all be swimming downstream as we manage wildlife for future generation based on science and knowledge not on an emotive Disney eutopia. The often vilified sustainable utilisation has never lead to the extinction of any animal, one only need look at the success of domestic livestock. 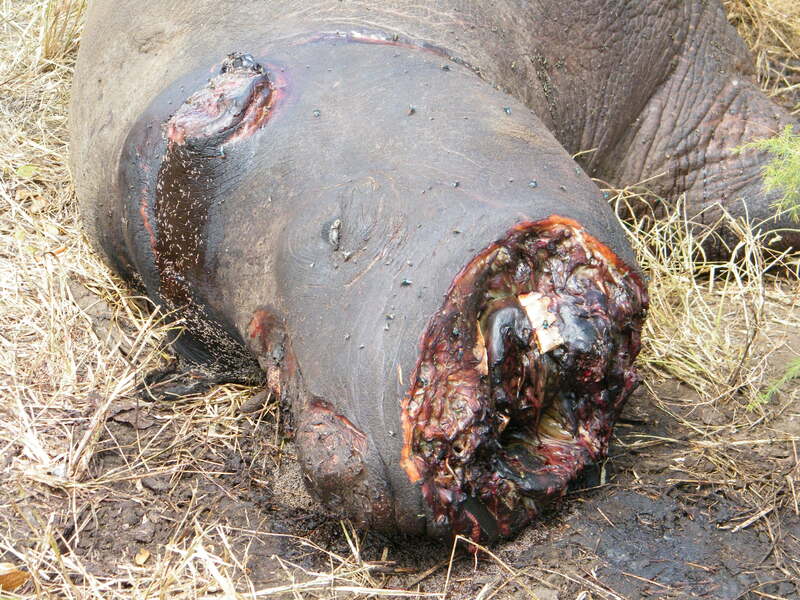 I have nothing to gain financially or otherwise by a legal trade or even if rhino survive or became extinct. Except should they became extinct I believe the world will be a poorer place for it. Currently Rhino are not benefiting from our present policies and the only two parties that benefit financially from the ongoing slaughter of our Rhino are the poachers and the animal rights organisations as they solicit millions in donations from an ignorant public to help “save” species and the ecosystems into extinction. The time for legal trade again is long past!